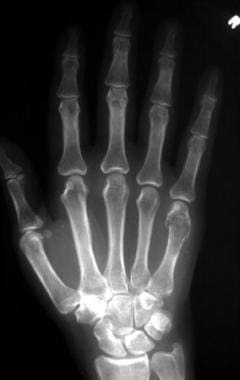 Frontal radiograph of the right hand demonstrates a lytic expansile lesion in the fifth metacarpal bone, with thinning of the cortex that has a somewhat scalloped appearance. 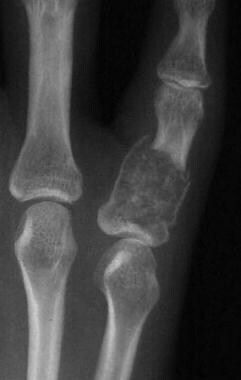 A pathologic fracture is noted, but no appreciable calcifications are seen in the lesion. 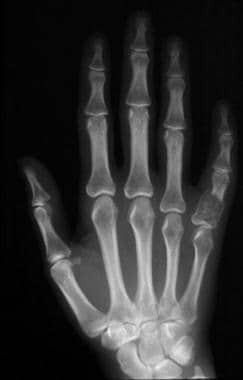 Frontal radiograph of the left hand demonstrates an expansile lytic lesion in the proximal phalanx of the fifth digit with a distinct zone of transition, thinning of the cortex, and a pathologic fracture. The lesion involves the diaphysis and approaches the end of the bone near the metacarpophalangeal joint. 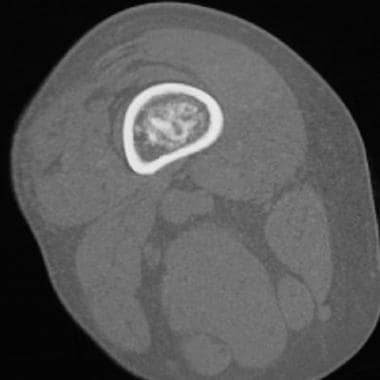 This finding is not uncommon in enchondromas of the small bones. Note the fuzzy calcifications in the matrix of the lesion. 62-year-old woman with enchondroma involving the proximal end of the proximal phalanx of her middle finger. The lesion has a lobular morphology and punctate calcifications. Because of pain, the lesion was curetted and packed with morselized allograft bone. When multiple enchondromas coexist, the diagnosis of enchondromatosis should be considered. Metachondromatosis is a very rare genetic disorder, with less than 30 reported cases. It is characterized by multiple enchondromas and osteochondromas. It has been linked to mutations in the PTPN11 gene and is inherited in an autosomal dominant manner. The first signs occur before puberty. Osteochondromas most commonly occur in the hands and feet, and enchondromas typically involve the iliac crests and metaphyses of long bones. Initially, radiography is the imaging modality of choice. If further characterization is necessary, magnetic resonance imaging (MRI) or computed tomography (CT) scanning is performed. If uncertainty remains, bone scanning may be helpful, but some lesions require biopsy. When the lesion has calcifications, the primary differential diagnoses are bone infarct and chondrosarcoma. 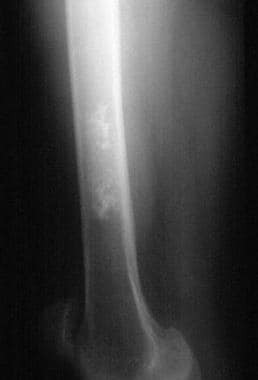 When the lesion is purely lytic, as shown on radiographs, the differential diagnosis consists of benign lytic lesions such as nonossifying fibroma, simple bone cyst, fibrous dysplasia, eosinophilic granuloma, and clear cell chondrosarcoma (which tends to involve the end of the bone—in particular, the proximal humerus). Angiography is not used in the diagnosis for evaluation of solitary enchondroma. In Maffucci syndrome, angiography may play a secondary role in identifying the extent and origin of the vascular malformation. A classic pattern of calcifications, described as rings and arcs, is pathognomonic when it is seen in the hands. In the long bones, calcifications may be difficult to distinguish from the dystrophic calcifications seen in bone infarction. In addition, radiographs may not depict the rings and arcs of calcifications, particularly in the hands and feet. Detail of a lytic expansile lesion in the fifth metacarpal bone in the right hand (same patient as in previous image). There is thinning of the cortex with a somewhat scalloped appearance. A pathologic fracture is noted, but no appreciable calcifications are seen in the lesion. Detail of an expansile lytic lesion in the proximal phalanx of the fifth digit with a distinct zone of transition, thinning of the cortex, and a pathologic fracture (same patient as in previous image). Radiograph of the right femur demonstrates a calcified intramedullary lesion in the distal shaft. 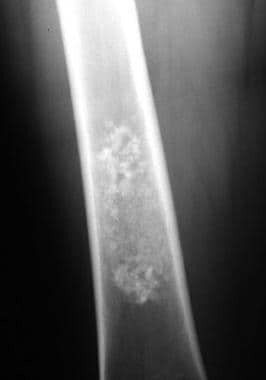 Radiograph of the right femur demonstrates a calcified intramedullary lesion in the distal shaft (same patient as in previous image). Frontal radiograph of the right thigh demonstrates coarse calcifications in the distal femur. On radiographs, the degree of confidence in the diagnosis of an enchondroma depends on the clinical situation and the appearance of the lesion. In the presence of pain, almost regardless of appearance, further investigation is warranted. Lesions that are predominantly lucent or are nonuniformly mineralized often require further investigation as well. In most cases, enchondroma and a low-grade chondrosarcoma cannot be reliably distinguished on the basis of radiographic findings alone. 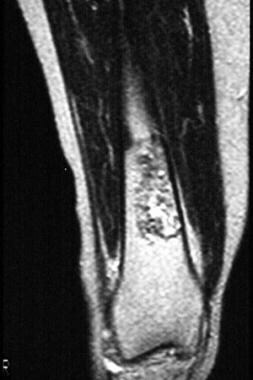 A calcified enchondroma can also mimic the appearance of a calcified marrow infarct. However, in most cases, chondrosarcoma has certain imaging features that are indicative of its aggressive behavior. Cortical breakthrough, soft-tissue mass, and deep endosteal scalloping of the cortex are 3 features that are described more frequently in chondrosarcoma. 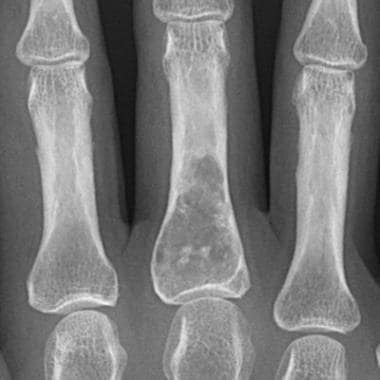 Deep endosteal scalloping with consequent pathologic fracture in the small bones of the hands and feet does not imply malignancy, however, because enchondromas are more cellular and expansile in these locations. In Ollier disease, enchondromas often appear to be larger than they do in other conditions. Because enchondromas occur in young patients and can be large, growth of the affected limbs may be adversely affected, and pathologic fractures may occur. 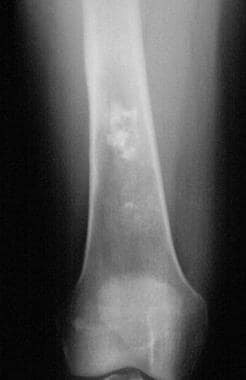 Enchondromatosis can occasionally have the appearance of linear lucencies, in which the chondrocytes appear to line up in a vertical orientation along the length of the bone. In Maffucci syndrome, associated soft-tissue hemangiomas are seen. Soft-tissue hemangiomas typically have numerous rounded calcifications with central lucencies, which are consistent with phleboliths on plain radiographs. T2-weighted MRIs of these lesions show high-signal-intensity tubular structures, which are consistent with slow flow in vascular channels. Metachondromatosis has associated osteochondromas, which differ from conventional osteochondromas in that they point toward rather than away from the joint. The features of enchondroma on CT scan are the same as those depicted on radiographs (see the image below). Enchondromas are endosteal lesions with a lobular morphology and variable mineralization. Often, the mineralization is in the form of rings and arcs, which correspond to calcification around lobules of cartilage. 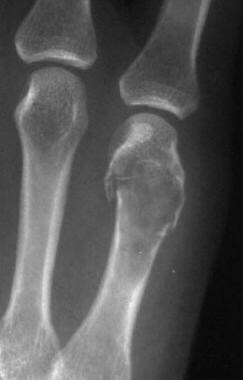 A pathologic fracture may be present. Sometimes, endosteal scalloping is present, but this feature may be suggestive of degeneration of the enchondroma to a chondrosarcoma. Enchondromas should not penetrate the cortex or extend into the soft tissues. If a densely mineralized or uniformly mineralized lesion has a region that is lucent, degeneration of the enchondroma to a chondrosarcoma is suggested, and biopsy is likely necessary. Axial computed tomography image demonstrates a fluffy calcific matrix within the medullary canal of the distal femur. The surrounding cortex is intact. As with radiographs, the degree of confidence in the diagnosis of an enchondroma with CT scanning depends on the clinical situation and the appearance of the lesion. The absence of pain, uniform or dense mineralization, and endosteal scalloping or cortical penetration are all indications of an enchondroma. However, if the patient lacks any of these features, further investigation may be necessary. Distinguishing an enchondroma from a low-grade chondrosarcoma is often problematic; sometimes, the diagnosis cannot be resolved without a biopsy. Because cartilage lesions are often not uniform at histologic examination, the entire lesion may need to be removed at biopsy. MRI findings may be useful in distinguishing enchondromas in the long bones from bone infarcts (see the images below). Typically, bone infarcts are encapsulated by a serpiginous rind of decreased signal intensity on T1- and T2-weighted images. Frequently, this rind is subtended by a high-signal-intensity line. This finding has been called the double-line sign, and it consists of a high-signal-intensity rind circumscribed by, and immediately adjacent to, a low-signal-intensity rind on T2-weighted images. Axial T1-weighted magnetic resonance imaging study shows an intramedullary lesion with low signal intensity and lobular morphology in the distal femur. The endosteal aspect of the cortex is not affected. Coronal T1-weighted magnetic resonance imaging study demonstrates predominantly decreased signal intensity within a lesion in the distal femur (same patient as in previous image). The lesion has a lobular morphology. No endosteal scalloping is noted. Axial T2-weighted magnetic resonance imaging study shows regions of high signal intensity in the lesion (same patient as in previous image). No surrounding edema is noted. Coronal T2-weighted magnetic resonance imaging study demonstrates small lobulated foci of increased signal intensity separated by a background mesh of decreased signal intensity (same patient as in previous image). The adjacent cortex is intact. Conversely, enchondromas tend to have lobulated borders with a cluster of numerous tiny locules of high-signal-intensity foci on T2-weighted images that appear to coalesce with one another and reflect the high fluid content of hyaline cartilage. On T1-weighted images, enchondromas demonstrate low-to-intermediate signal intensity. When a calcific chondroid matrix is observed on radiographs, decreased signal intensity is expected to occur in those areas on images obtained with all MRI pulse sequences. These areas may become particularly pronounced on gradient-echo images. When combined with a typical appearance on radiographs and an absence of pain, the diagnosis of enchondroma with MRI findings can be made with a high degree of confidence. 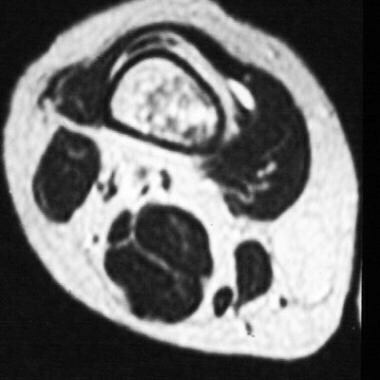 Enchondromas may also be incidental findings at routine examination, such as MRI of the knee. If the lesions have a typical appearance, a confident diagnosis may be made; however, the acquisition of correlative radiographic findings is often prudent. Occasionally, enchondromas can be difficult to distinguish from other intraosseous benign and malignant lesions on the basis of MRI findings alone. Correlation with other results, particularly radiographic results, may help. The presence of bone pain always warrants further investigation. With technetium-99m (99mTc) radionuclide bone scanning, findings are typically negative in uncomplicated enchondromas, but the presence of pathologic fracture results in intense activity at the fracture site. In patients with multiple enchondromas or patients in whom an enchondroma is actively calcifying, radionuclide bone scans may show increased activity, but the activity is typically less intense than that of intramedullary chondrosarcomas. Positron emission tomography (PET) using 18-fluorodeoxyglucose (18-FDG) has been applied increasingly to the evaluation of tumors. Using PET to evaluate enchondromas—particularly to distinguish benign enchondromas from low-grade chondrosarcomas—has been reported in small series. Radionuclide bone scanning is one method used to assess lesions depicted on radiographs or MRIs that are presumed to be enchondromas. If the bone scan results are negative, the possibility of a malignancy (eg, chondrosarcoma) is extremely remote. If the scan results are positive, biopsy is typically necessary. Radionuclide bone scan findings are not reliable in differentiating enchondroma from calcified marrow infarct. Radionuclide bone scan findings are nonspecific; therefore, one cannot reliably diagnose a focal bone lesion on the basis of these findings alone. However, the physiologic information provided by a bone scan, when combined with information from other imaging modalities, can be helpful. Singh P, Kejariwal U, Chugh A. A Rare Occurrence of Enchondroma in Neck of Femur in an Adult Female: A Case Report. J Clin Diagn Res. 2015 Dec. 9 (12):RD01-3. [Medline]. [Full Text]. Semenova LA, Bulycheva IV. [Chondromas (enchondroma, periosteal chondroma, enchondromatosis)]. Arkh Patol. 2007 Sep-Oct. 69(5):45-8. [Medline]. Sunny G, Hoisala VR, Cicilet S, Sadashiva S. Multiple Enchondromatosis: Olliers Disease- A Case Report. J Clin Diagn Res. 2016 Jan. 10 (1):TD01-2. [Medline]. [Full Text]. Sadiqi J, Rasouly N, Hamidi H, Siraj S. Radiographic features of Ollier's disease - two case reports. BMC Med Imaging. 2017 Dec 2. 17 (1):58. [Medline]. [Full Text]. D'Angelo L, Massimi L, Narducci A, Di Rocco C. Ollier disease. Childs Nerv Syst. 2009 Jun. 25(6):647-53. [Medline]. Moser T, Lin XZ, Bazille G, Fleury M, Dietemann JL, Kremer S. Progressive hemianopsia caused by intracranial enchondroma in Ollier disease. Neurology. 2008 Dec 9. 71(24):2018. [Medline]. Le BB, Nguyen BD. Ollier disease with digital enchondromatosis: anatomic and functional imaging. Clin Nucl Med. 2014 Aug. 39 (8):e375-8. [Medline]. Kumar A, Jain VK, Bharadwaj M, Arya RK. Ollier Disease: Pathogenesis, Diagnosis, and Management. Orthopedics. 2015 Jun. 38 (6):e497-506. [Medline]. Al-Katib S, Al-Faham Z, Grant P, Palka JC. The Appearance of Maffucci Syndrome on 18F-FDG PET/CT. J Nucl Med Technol. 2015 Jun. 43 (2):131-2. [Medline]. [Full Text]. Katz P, Colbert R, Drolet B. Unilateral mosaic cutaneous vascular lesions, enchondroma, multiple soft tissue chondromas and congenital fibrosarcoma--a variant of Maffucci syndrome?. Pediatr Dermatol. 2008 Mar-Apr. 25(2):205-9. [Medline]. Ranger A, Szymczak A. The association between intracranial tumours and multiple dyschondroplasia (Ollier's disease or Maffucci's syndrome): do children and adults differ?. J Neurooncol. 2009 Jun 9. [Medline]. Zwenneke Flach H, Ginai AZ, Wolter Oosterhuis J. Best cases from the AFIP. Maffucci syndrome: radiologic and pathologic findings. Armed Forces Institutes of Pathology. Radiographics. 2001 Sep-Oct. 21(5):1311-6. [Medline]. [Full Text]. McFarlane J, Knight T, Sinha A, Cole T, Kiely N, Freeman R. Exostoses, enchondromatosis and metachondromatosis; diagnosis and management. Acta Orthop Belg. 2016 Mar. 82 (1):102-5. [Medline]. [Full Text]. Bilginer Y, Düzova A, Topaloğlu R, Batu ED, Boduroğlu K, Güçer Ş, et al. Three cases of spondyloenchondrodysplasia (SPENCD) with systemic lupus erythematosus: a case series and review of the literature. Lupus. 2016 Jun. 25 (7):760-5. [Medline]. Tran Mau-Them F, Boualam A, Barat-Houari M, Jeandel C, Cottalorda J, Cormier-Daire V, et al. Dysspondyloenchondromatosis without COL2A1 mutation: possible genetic heterogeneity. Am J Med Genet A. 2014 Mar. 164A (3):769-73. [Medline]. Flemming DJ, Murphey MD. 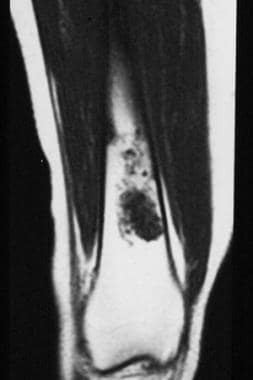 Enchondroma and chondrosarcoma. Semin Musculoskelet Radiol. 2000. 4(1):59-71. [Medline]. Jaffe HL, Lichtenstein L. Solitary benign enchondroma of bone. Arch Surg. 1943. 46:480-93. McDermott AL, Dutt SN, Chavda SV, Morgan DW. Maffucci''s syndrome: clinical and radiological features of a rare condition. J Laryngol Otol. 2001 Oct. 115(10):845-7. [Medline]. Robbin MR, Murphey MD. Benign chondroid neoplasms of bone. Semin Musculoskelet Radiol. 2000. 4(1):45-58. [Medline]. Wang XL, De Beuckeleer LH, De Schepper AM, Van Marck E. Low-grade chondrosarcoma vs enchondroma: challenges in diagnosis and management. Eur Radiol. 2001. 11(6):1054-7. [Medline]. Crim J, Schmidt R, Layfield L, Hanrahan C, Manaster BJ. Can imaging criteria distinguish enchondroma from grade 1 chondrosarcoma?. Eur J Radiol. 2015 Nov. 84 (11):2222-30. [Medline]. Chun KA, Stephanie S, Choi JY, Nam JH, Suh JS. 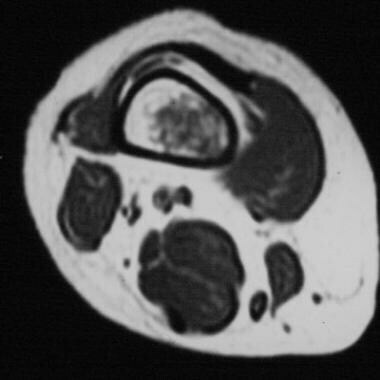 Enchondroma of the Foot. J Foot Ankle Surg. 2015 Sep-Oct. 54 (5):836-9. [Medline]. De Coninck T, Jans L, Sys G, Huysse W, Verstraeten T, Forsyth R, et al. Dynamic contrast-enhanced MR imaging for differentiation between enchondroma and chondrosarcoma. Eur Radiol. 2013 Nov. 23 (11):3140-52. [Medline]. Figl M, Leixnering M. Retrospective review of outcome after surgical treatment of enchondromas in the hand. Arch Orthop Trauma Surg. 2009 Jun. 129(6):729-34. [Medline]. Feldman F, Van Heertum R, Saxena C, et al. 18FDG-PET applications for cartilage neoplasms. Skeletal Radiol. 2005 Jul. 34(7):367-74.